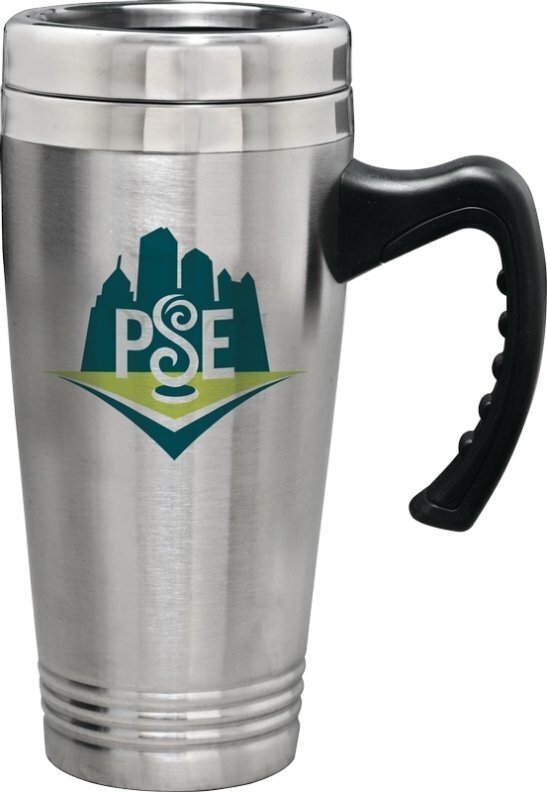 Double Wall Stainless Steel Travel Mug is what you want, get it at a low cost. Applications do include business, trade show, employee gifts, marketing. double wall stainless insulation, large handle, push on slide open lid. You MUST order this stainless steel in whole cartons of 24 units. Price includes one std. color imprint on two sides area 2" w x 2 1/2" h.
The pictures on the site really looked good but the actual product is far beyond in size and quality. Our logo was two color and my rep showed me how to save money by doing it in one color and the imprint looks great, on two sides no less! I originally bought these for customers but our drivers went crazy over them as well. Recommend this mug to anyone.